Hello lovelies! Another weekend has gone by and since I had fall break Thursday and Friday, (thank God!) I have lots to update you on! My sister Hannah had her one year check up at St. Jude's Children's Research Hospital in Memphis, Tennessee, so I went up there with her and my mom! It was so nice to have some cold fall-ish weather finally and actually get to see leaves change colors before they're completely gone. All in all it was a great visit and all of her tests results came back with good news! Yay! These are a few pics from the first day we were there! I brought plenty of magazines to the hospital to catch up on some reading in the waiting rooms and FINALLY got to wear my cape for the first time this season. Obviously, I was so so chuffed about it. The 3 garden type pictures are from a garden on the grounds that house the graves of Danny Thomas, the founder of St. Jude's and his wife Rose. The garden has pretty water features and plenty of benches and is such a nice place to relax and enjoy the beautiful day, especially for families and patients under lots of stress. This is a picture I took just to show you what the main part of the hospital looks like. It is seriously huge and so gorgeous inside! 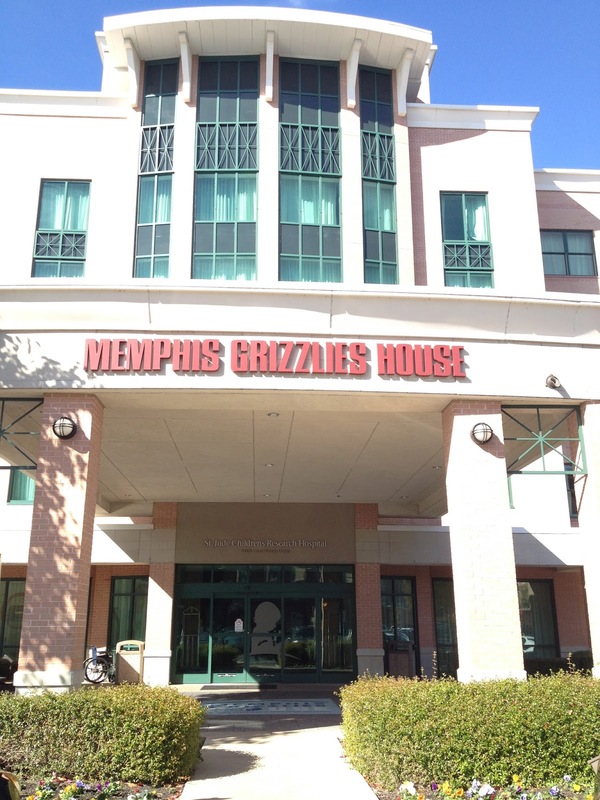 The Memphis Grizzlies House is where we stayed, as it is sort of like a hotel on the grounds for short term stays. It is all basketball themed because the local professional basketball team donated the money to build it. This is the Target House, donated by Target of course, and even though it's hard to see, it is basically a HUGE mansion. This is where people with long term conditions stay and it is amazing. My family went there a few years back for an Easter Egg hunt and the grounds are so beautiful! For people staying a couple of weeks or more, there is a Ronald McDonald house right by the hospital, and while we've stayed there before, we didn't visit this trip for me to get a picture! This is the inside of the Chili's Care center wing, probably one of my favorite places in the hospital. Past the front desk are huge fish tanks as well as little computers for kids to play games while they wait for appointments. Obviously, Hannah and I, at 16 and 19, are way too old, but we still played them and had lots of fun competing at 7th grade level games. This shot is a mini panorama of the lobby by the cafeteria. It just shows how bright and happy the inside of the whole hospital is. There are so many windows and sky lights that this whole area is always bright and generally FULL of people. The little bar thing to the right is a huge ice cream bar and while that may look like dots on the wall, it is actually different flavor scoops of ice cream. Very festive! I wish that I had taken pictures more inside but because of patient privacy I couldn't. If you don't know about St. Jude's, it is a hospital for children with cancer and other terminal illnesses. They treat patients up to 18 and no family ever pays for anything. While most people hear that and think just treatment, I mean everything from the flight up there, housing while there, daily food credits, and even a grocery card sometimes. Not only do they make sure treatment is well taken care of, but the whole hospital is so happily painted and decorated and the employees are constantly so helpful and positive. It really is such a blessing to have a place like that there and I am so thankful for all the help they've given not only my family but so many others! On Friday afternoon after Hannah's appointments were finished, we went to the Memphis Zoo. The whole entire place is incredible (I mean, they have camels you can ride! ), but this was my favorite part. It's a little aquarium tucked away in the back corner of the zoo, and when I walked in it was just heavenly. It was dark and cozy and there were cool fish all around. Ever since snorkeling in the Bahamas with my dad in middle school, aquariums have been like my happy place and any time I can go, I absolutely love it. This little gem is an ice skating rink right in the middle of the zoo! After Thanksgiving they have nights where you can come and skate and see the zoo all lit up and I'm just obsessed! I think that would be such a cool date idea with hot chocolate, zoo animals, lights, and skating! But first I have to find and boyfriend. And move to Memphis. Moving on! As I've already overloaded this post with pictures, I collaged together a few of my favorite zoo things! The fish was my favorite in the aquarium (so hard to pick since I took a bajillion pics and loved each one!). In Louisiana we don't very many colorful trees, so I had to snap a picture of this one. It was gorgeous and against that perfect blue sky, I'm in love. The bamboo was so cool because it was everywhere and people had carved all sorts of things into it. I thought it was kindof like a living, growing journal, and that thought was so pretty I need to document it with a terribly grainy picture! The lodge on the bottom left is made to look like a ski lodge and is so beautiful inside! The wolves and bears and animals like that are housed next to it though, so I don't think I'll be moving in! The last picture is the entrance to the zoo and they had all kinds of lights strung up already! As I'm totally already in Christmas mode, #dontjudge, I loved it! Again, such a gorgeous day! On Saturday we drove home and I took the longest bath ever and then watched Dawson's Creek and lounged on the couch. That night, I made actual plans with Caroline, quelle suprise! 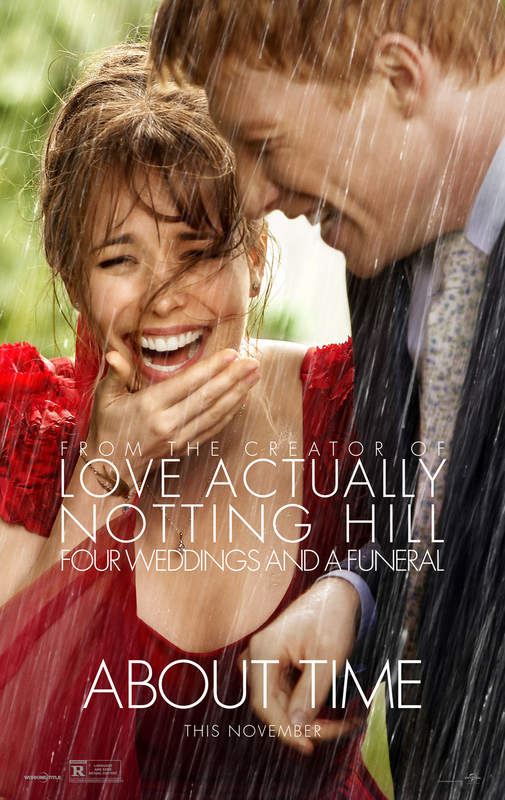 and we went to see About Time. Y'all. I can't even describe how much I loved it. I knew that I would because Love Actually is one of my all time favorites and it's made by the same people, but omg I was so unprepared. I'm actually planning to go see it again already. It has the love story element, the family element, and a bit of comedy and sic-fi (due to the time travel bit). I do not cry and this film had me tearing up in the best way. I really, REALLY loved it and recommend you go see it with every one you know. It makes you focus on the important things in life and realize you've got limited time so you better make it count! Sunday was a bit rushed as I had lunch at my dad and step-mom's, headed back to school, went to church and then a board meeting for a club I'm in, and then got ready for this week! Phew! Here's a pic of the Baton Rouge bridge just because it's pretty! Great pics; especially your fish one! Sounds like you had a lovely weekend. Thanks for sharing.